Nothing is as classic a piece as a sterling silver ring, and this beautiful Sterling Silver 4mm Flat Band is just the one for you. Its slender design has a graceful appeal, which has a way of elongating the fingers and complementing the hand. This attractive, 4mm wide band is finely crafted from none other than high quality .925 sterling silver, which is evident from the ring's pure silver hue. 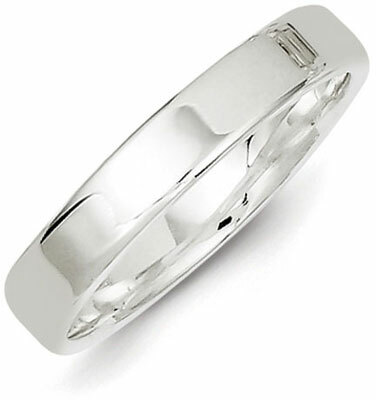 The sides of the band are nicely rounded to enhance the design, as well as to offer an easy fit on the finger. Glimmering under the light thanks to its lovely high-polish finish, this sterling silver band can stand on its own or be matched with other pieces of similar quality. This 4mm sterling silver band can be fitted for any finger, depending on the look you want to achieve, and makes for a wonderful wedding band for your ring finger. The ring's beauty lies in its simplicity and versatility, which will undoubtedly make it an enduring piece to add to your collection and to be worn again and again. We guarantee our Sterling Silver 4mm Flat Band to be high quality, authentic jewelry, as described above.